The list of reasons to adopt Grafana dashboards is long. Among other things, Grafana dashboards are excellent tools for gaining insight into time-series data. In addition, Grafana readily integrates with InfluxDB and Telegraf to make monitoring of sensor, system and network metrics much easier and far more insightful. The process of setting up a Grafana dashboard and integrating it with various data sources is straightforward. Grafana template variables enable you to create dynamic dashboards that you can make changes to in real-time. In this post, we cover in more detail what you have to gain by setting up Grafana Dashboards and the easy steps involved to do that. What is a Grafana Dashboard? A Grafana dashboard is a powerful open source analytical and visualization tool that consists of multiple individual panels arranged in a grid. The panels interact with configured data sources, including (but not limited to) AWS CloudWatch, Microsoft SQL server, Prometheus, MySQL, InfluxDB, and many others. Grafana is designed so that each panel is tied to a data source. Because the Grafana dashboards support multiple panels in a single grid, you can visualize results from multiple data sources simultaneously. The purpose of Grafana dashboards is to bring data together in a way that is both efficient and organized. It allows users to better understand the metrics of their data through queries, informative visualizations and alerts. Not only do Grafana dashboards give insightful meaning to data collected from numerous sources, but you can also share the dashboards you create with other team members, allowing you to explore the data together. Another key aspect of Grafana dashboards is the fact that they are open source, which allows for even more customization and power, depending on how comfortable you are with coding. However, you do not need extensive knowledge of coding to create your own fully functioning Grafana dashboard. It is very easy to set up a Grafana dashboard. 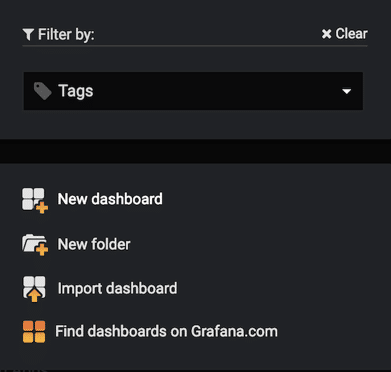 You begin by creating a new and blank Grafana dashboard by clicking on the Dashboard link, which is located on the right side of the Dashboard Picker. Dashboards contain panels, so now that you have a blank dashboard the next step is to add your first panel. Note that Grafana is shipped with a variety of panels to help you get started quickly. You can think of Grafana panels as visualization building blocks. Panels are added via the Add Panel icon that is located at the top of the menu. Panels are not very useful unless some type of graph is associated with them. Graphs depend on data, so each panel that you add to the dashboard will be associated with a data source. To retrieve information from that data source for the panel, you will need to create a query. A query is set up by editing the graph that appears on the new panel. Click on the graph title, followed by Edit. This will open up the Metrics tab, where you are presented with a Query Editor. This easy-to-use Query Editor allows you to build queries based on the data source for your panel. Grafana will take the results of the query and provide visualizations of the resulting metrics. Note that the Query Editor will allow you to build more than one Query for the data, thus supporting multiple series for graphs. The Metrics tab is also where you change the graph style, apply functions to the group of metrics, set the auto-refresh rate for the visualization, and adjust properties such as time range controls and zoom. Graphs can include bars, lines, points, and multiple Y-axes. Grafana offers smart Y-axis formatting, axis labels, grid thresholds, and annotations. Once you have created the panels that you want, building the dashboard becomes a simple process of drag and drop. Drag the panels to the dashboard grid and drop them where you want them to appear. Then, resize them to suit your needs. If you do not feel comfortable starting your own Grafana dashboards from scratch or don’t know how to set up a Grafana dashboard, there are official Grafana dashboard examples available on the Grafana Labs website. In fact, this is where you will find the best Grafana dashboards. 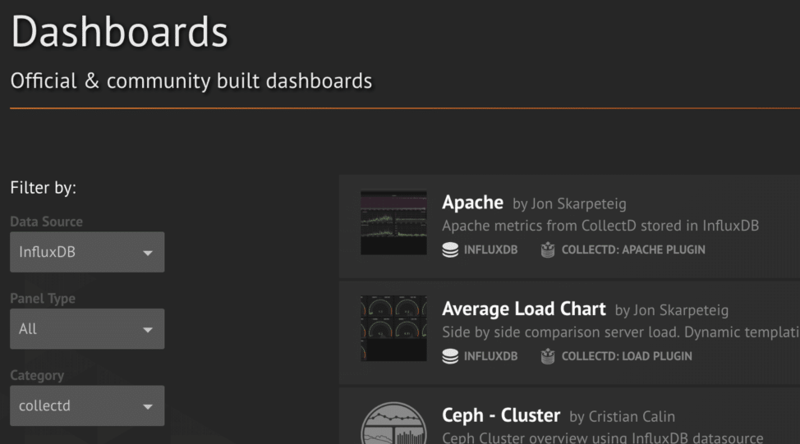 Find Grafana Dashboards for use with InfluxDB. These Grafana dashboard examples can be filtered based on the collector used. Some of these collectors include Beats, Icinga, Snap and Telegraf. You can also filter these examples based on panel type. Text, table, trend box, annunciator, boom table, breadcrumb, and alarm box are just a few of the many panel types for which you can find Grafana dashboard examples. If connecting to a data source is your primary concern, you can also filter the available dashboard examples by the data source. This allows you to see Grafana dashboard examples for sources such as AWS CloudWatch, Amazon Timestream, Prometheus, Elasticsearch, InfluxDB and many others. Grafana dashboard templating is used to make your dashboards more interactive. In short, you create dashboard Template variables that can be used almost anywhere in a Grafana dashboard. The use of variables allows you to make dynamic, on-the-fly changes to the dashboard. This significantly adds to the usefulness and power of Grafana. The Grafana dashboard is a powerful data analytics and visualization tool that integrates with a wide variety of sources that store time series data, including the data source InfluxData. The Grafana dashboard is open source and provides extensive documentation that is user-friendly. For those new to Grafana, remember that there are resources where you can find the best Grafana dashboards to help you get started. For those interested in more dynamic dashboards, Grafana dashboard templates would be your starting point. When Grafana dashboard is integrated with an InfluxDB data source, you have access to customized visual presentations of key metrics and events with fast rendering, even over large time spans. Grafana dashboards, when integrated with InfluxDB, provide extremely useful and revealing visualization of the system and network metrics. If you need access to real-time analytics based on time series data, InfluxData is the platform for you. If you want to delve deep into the meaning of that critical data, then combining InfluxData with Grafana dashboard is the smartest choice you can make. Choose InfluxData and create the best Grafana dashboards.